From left, Arrowhead 135 bikers Ben Doom, Dan Jansen, and Dan Dittmer approach the first checkpoint during the 2012 Arrowhead 135. Photo from International Falls Journal. For the second year in a row, the 135-mile winter ultramarathon known for its unpredictable trail conditions and brutal cold came down to a five-second sprint. 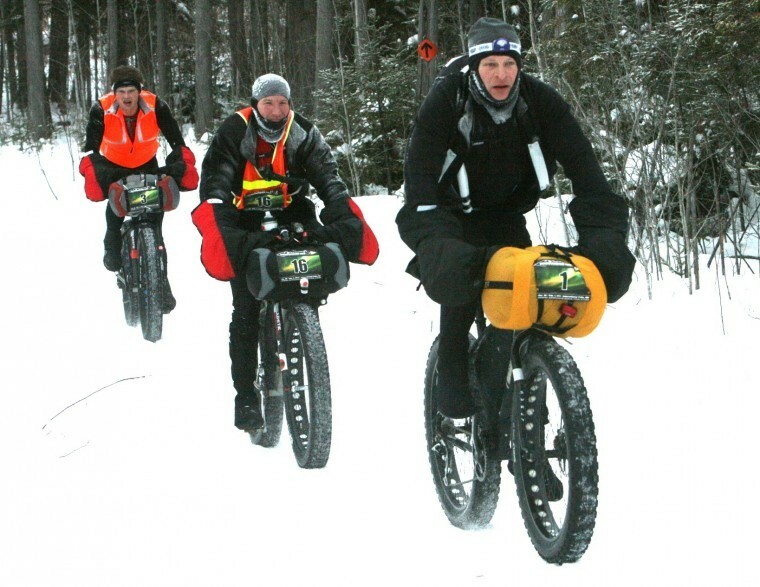 Snow bikers Todd McFadden of Minnesota and Alaskans Jeff Oatley and Kevin Breitenbach set a blistering pace from the start, then hung onto each others’ wheels for the duration of the Arrowhead 135 as they traversed over frozen lakes, snow-covered swamps, and rolling hills. McFadden pulled ahead in the final seconds of the race to claim the win with a course-record time of 14 hours and 20 minutes. Oatley crossed the line five seconds later, and Breitenbach was five minutes behind them. 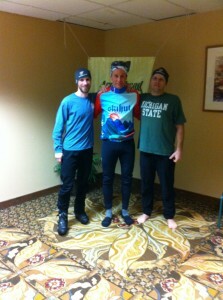 The Arrowhead 135 podium, from left, Kevin Breitenbach, Tom McFadden, and Jeff Oatley. Photo by Russell Loucks. 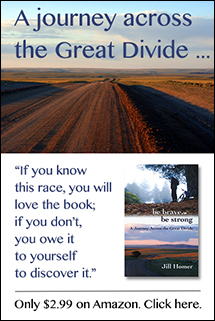 The three were racing a coming storm and deteriorating trail conditions as much as they were racing each other. The fourth finisher, Ben Doom, wouldn’t arrive at the finish for another hour and 21 minutes, and fifth place Steven Yore was a full two hours behind the winners. As finishers trickled in, they reported above-freezing temperatures and new snow falling on the trail, leaving a soft and slushy surface for the remaining racers to battle. The ninth annual Arrowhead 135 kicked off at 7 a.m. Monday in International Falls, Minnesota. A record field of 138 competitors lined up for the race that travels 135 miles down the Arrowhead State Trail to end at Fortune Bay Casino, near Tower, Minnesota. Ninety bikers, 43 runners, and five skiers started this year’s race, representing at least 21 states and a half-dozen countries. Early in the race, skies were cloudy and temperatures ranged from 25 to 35 degrees, unseasonably warm for this region in late January. A predicted storm with heavy snow began to move in later in the evening, just as the lead cyclists were finishing their 14-hour sprint. As of 1 p.m. Tuesday, 30 hours into the race, there were still only 26 finishers, all male bikers. The leading female cyclist, Jill Hueckman, dropped at the mile 70 aid station, citing 8 inches of new snow that made it impossible to ride her bike. Runners and skiers are still moving strong on the course, although the names of those who have dropped from the race continue to increase. Parker Rios of Wisconsin holds a strong lead in the foot division, having pulled out of the mile 70 checkpoint five hours ahead of second-position runner John Storkamp. Mark Scotch leads the charge among the three skiers still in the race. A scan of the current race standings indicates that there may only be one female cyclist and three female runners still racing in this year’s Arrowhead 135. The race cut-off is sixty hours, or 7 p.m. Wednesday. Updated raced results are available at http://www.arrowheadultra.com/index.php/results/2013-results. Sounds like much tougher going than we had. I was the 18th runner to leave MelGeorge’s last year at 11am. This your that time would put you in 3rd! Also, looks like temps are getting ready to drop overnight, though that may not be a bad thing.